These are my childhood memories of the holidays. During break, my sister and I would spend days (if not a full week) at my grandmother’s house. She was a cook and baker extraordinaire. Most of what I learned about cooking and baking was from my grandmother. Do you remember favorite recipes that your grandmother would make? Our family had several favorites, but the overall top pick was her Red Velvet Cake. Everyone saved just enough room from dinner to be sure to have a slice. Going to her house to be with family meant times of crafting, baking, and looking at the decorative lights. My cousin, my sister, and I would bundle up into the truck, and my grandparents would take us driving around to different light displays. 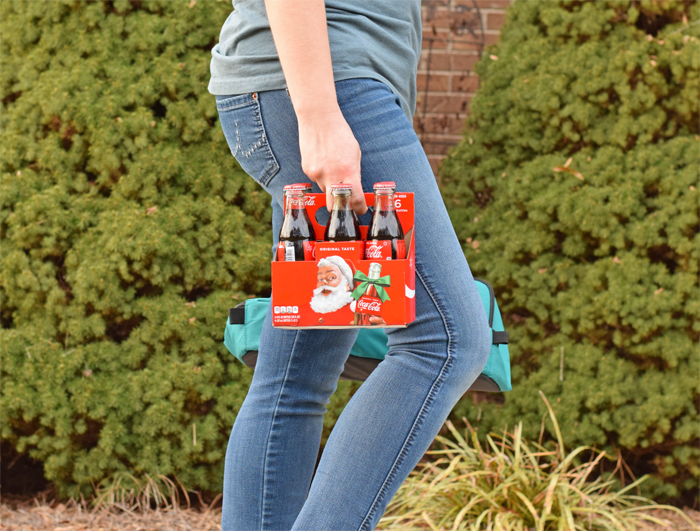 My grandmother would have a refrigerator filled with Coca-Cola® waiting on us when we returned. Grandparents are known for spoiling their grandkids, right? Now that I’m older, “going home” or “going to my grandmother’s” doesn’t look the same as it did back then. Now, I’m the one cooking and crafting and baking. But the important part is that she is there to share it with my kids just as she was with me when I was as child. Without her traveling to spend the holidays with us, this would not be possible. This holiday season, visit Publix for the text code to enter for a chance to win airfare for two to travel home for the holidays. There are 5 grand prizes, each including round trip airfare for two to anywhere in the continental US. The sweepstakes ends 12/30. If I won, I would love to take my grandmother to spend a few days of break in the Blue Ridge Mountains. This was always a second home to her, and I know that she has not been there in years. Several cities in the mountains have special light shows during the holidays, and I would make the holidays special by taking her to see the light shows just as she used to do with me. While shopping at Publix last week, I found the Coca-Cola in Limited Edition Holiday packaging. It immediately took my mind back to those holidays years ago spent at my grandmother’s house. I grabbed a pack to take to our party, along with a few other items. Publix makes shopping so easy with their store layout and no-clip coupons! Find your local Publix here. Are you heading home for the holidays? 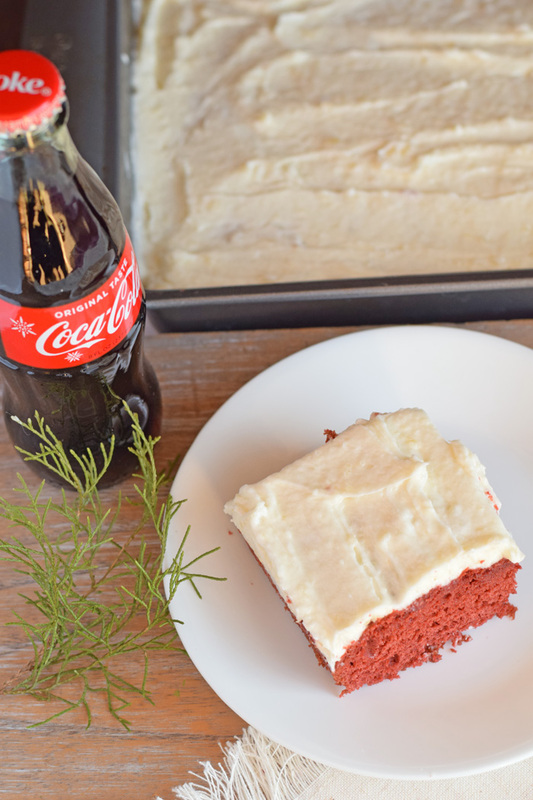 I’ll leave you to reminisce of the holidays past with this delicious Red Velvet Cake recipe, similar to what my grandmother used to create. Preheat oven to 350 degrees and grease a 13×9 sheet pan with extra shortening. Place the 1/2 cup of shortening and the sugar in a large bowl. Mix until fluffy. Add the two eggs to the mix and combine thoroughly. Add red food coloring and cocoa. Mix. Combine salt, vanilla, and milk in a separate large bowl. Set aside. Add the flour, 1/2 cup at a time, to the shortening mixture and stir. Grab the milk mixture that you set aside earlier. Add the milk mixture to the batter and combine. Fold in the vinegar and baking soda. Place the batter into the greased pan. Bake for approximately 30 minutes. Test to see if the cake is done with a toothpick in the center of the cake. If the cake is not done, place it back in the oven for another 5-10 minutes and check again. Cool cake completely. Add your choice of icing. My grandmother is the one who taught me how to cook and bake as well. I LOVED going to either of my grandmothers. One of my grandmothers always had Coca-Cola in bottles. I have to say, this is where I developed my loved of Coca-Cola – I WISH they sold it economically today in bottle. I still remember opening a cold bottle when we were allowed to have one! There’s nothing quite like holiday memories! I loved reading about your memories from growing up. Family recipes are always the most special and I love this festive cake! I used to love cooking with my grandmother but she was not a cake maker. She was a pie maker. But over the years, I am so much more of cake eater and I love your red velvet cake recipe. I have to say I love treating myself to a coke when I dine out. Nothing beats the taste, nothing! 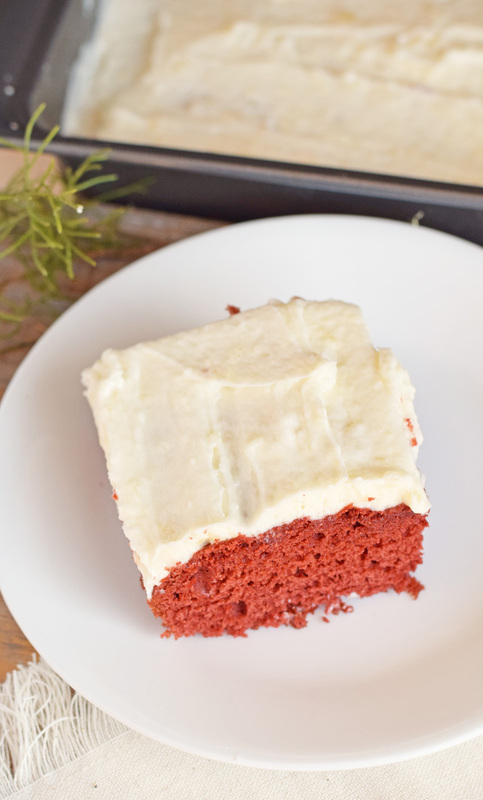 While I like the red velvet cake in and of itself because it is so darn pretty, I really do prefer a red velvet that actually tastes chocolaty. In the early 90’s my mom made a recipe out of Gourmet magazine (it might have been in the holiday issue) My goodness, it was chocolaty and red and wonderful. I think because it had a higher amount of cocoa powder than more standard versions. That looks like a great recipe. I am a big fan of Coke as well, I just love Diet Coke so much. When I was a kid, we drank regular Coke often but ever since I was a teenager I drank Diet and have loved it ever since. It is the best! I love thinking about holiday memories. So many great ones and they usually revolve around the kitchen and cooking. 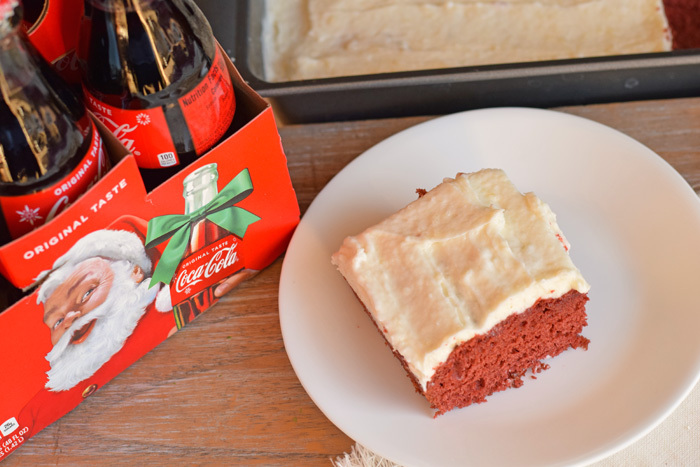 I love the classic coke bottles, what a special holiday treat to bring to a gathering. That recipe looks so great too. YUM! Growing up as the last of 10 children, I did not get many opportunities to hang out with my grandparents. We always had a big feast at home mixed with some of our favorite beverages served in bottles. My mom has a weakness for coke. Definitely time for me to start thinking of passing my family traditions once I start a family of my own. 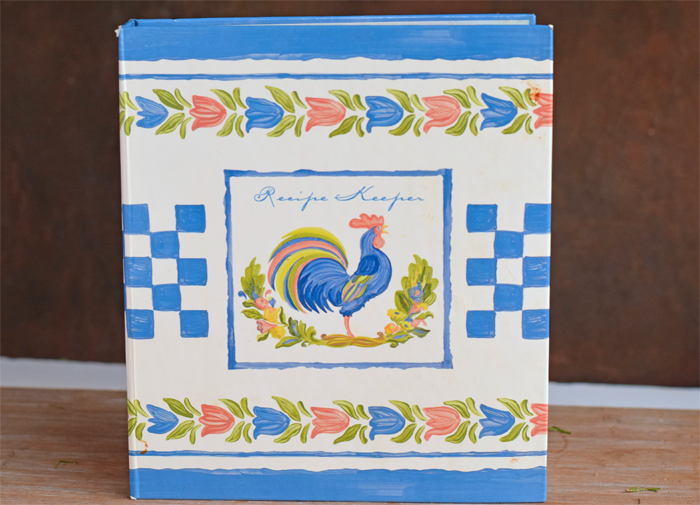 I am still checking out with my mom if my grandmothers recipe book is still alive. Good to know you had that red velvet cake recipe. This is one of my favorite yet I don’t know ow to do it. Now I can try it on my own then. The Coca-cola limited edition packaging is no nice too. It does look good for Red Velvet Cake. I wish my daughter were more of a fan. I would definitely try making this. Unfortunately she is not, and I don’t want to be the only one eating the cake. Maybe I can try it out for a work event.